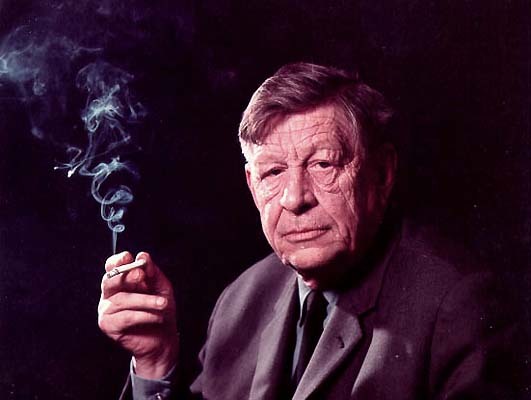 Auden probably had never heard of TSG syndrome so he may not have known that his rapid aging was the result of anything other than how he was living his life. It was a life lived in a cloud of cigarette smoke and almost continuous writing. Fueled by amphetamines, which he believed made him more productive, he certainly was productive: four hundred poems (many very long), almost the same number of essays and book reviews, several verse plays, and all written between the mid-1920s and his death in September 1973. At night, to bring that constantly working mind to some static place, he took sleeping pills and drank. It is a rainy, gray November afternoon in upstate New York today, in which the light remains dim from dawn till after dusk; what color there is is colors that were: expired leaves lingering on branches, uncollected rakings shoved into the roads. Autumnal Auden comes to mind. Your damp to definite drops. and minding our p’s and q’s. I’m not sure what it is about that poem, but I just like it. Something soft about it I connect with. you left and I cried for many years. that you repeated when I said them. that misses you every day. Do you ever reply to anyone? W.H. Auden was born 108 years ago today.